This marks the first day of The Head of Medusa blog tour hosted by Barclay Publicity. Today is also the release day for it as well, which is super exciting. I will be sharing my ARC review and thoughts on this book, and let me tell you, it was absolutely astounding. Also make sure to check the bottom of the post for a special giveaway; Michelle is giving one(1) signed copy of the first Elementals book. Follow the Elementals as they journey to the end of the Earth, facing choices that will put their lives and the entire world at risk. Will they all survive the mission? Find out in the riveting third book in the Elementals series. I give this book a rating of 4.4 out of 5. The Head of Medusa brought a lot of new things to the table and the bar higher for the rest of the Elemental books in this series. It allowed us to see the characters grow even more in their use of elemental control, as well the setting were really unique in this particular book. The story began a little after where book 2 had ended. I believe the story had a faster pace to it, then the other books. I think The Head of Medusa had one of my most enjoyed story line to it. I have enjoyed Michelle's Previous books a lot, but it was just something about: Nyx, the Ice Palace, Medusa, the magic, and the swoon worthy moments, that made me enjoy this book so much more. I also particularly loved the action in this book a lot more as well. Another thing Michelle excelled at in this book were her characters. Each brought their own element to the story line (No pun intended). It was also nice to easily connect with the main characters and see their general points of view. Another thing I would like to point out it how well she showed the all the different character relationship. It obvious that there has been growth since the first book, and I really enjoyed seeing that. Overall not only did the main characters show tremendous strength, wit and major growth as a group, but the secondary characters were just as strong and witty as well. I really enjoyed all the extra characters included in the stories. 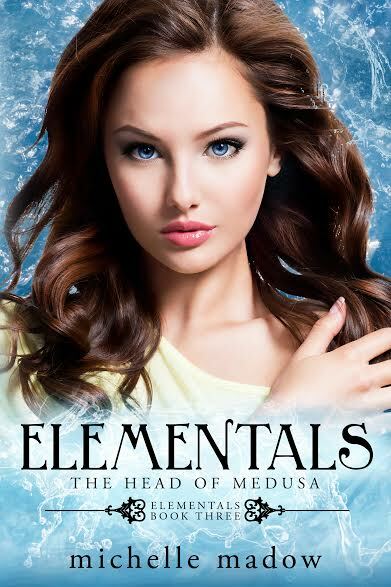 In conclusion, Michelle Madow's Elementals: The Head of Medusa. should be on everyone's TBR list if they really enjoyed the previous two books in this series, but also for those who enjoy the good use of story telling that revolves around magic and myths. I highly recommend this book, and hopefully for those who have read it will enjoy the book just as much as I did.